Recruitment Marketing 101 is an overview of different processes used for building and communicating organization's Employer Brand and Employee Value Proposition. The goal of every recruitment marketing element is to attract and hire top talent. This term is rapidly becoming one of the hottest topics in the world of recruiting and Talent Acquisition. 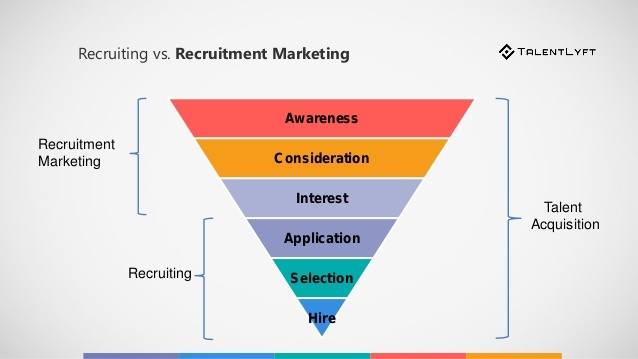 Recruiters that already haven’t, should get familiar with Recruitment Marketing best practices. Before we start, I suggest you to get our free guide about the most productive recruitment marketing strategies! Recruitment Marketing is the process of nurturing and attracting talented individuals to your organization using marketing methods and tactics. Even though it has emerged as an HR buzzword, it is now a must-have recruiting strategy. drive talent to apply to the open positions your company has available. Recruitment Marketing strategy has emerged as a consequence of the current situation in the HR industry. Demand for talent has far exceeded its supply. This has resulted in the “War for Talent”. In this war, the biggest power has talent. Consequently, the way we recruit has changed dramatically. Talent has many options to choose from, and they do so the same way as they buy products and a services. For those reasons, advertising jobs and searching for candidates has become very similar to advertising products and searching for customers. Can you see how the word “marketing” ended up next to recruiting? Unlike few years ago, the whole recruiting process is much more complicated and way longer. In fact, successful recruiters always recruit. Even when they don’t have open positions. In the the first 3 stages, candidates search about firm’s reputation and employee value proposition. They look for information about current employees, benefits, company’s culture, career and growth opportunities, interesting projects and events. Modern recruiters, using marketing tactics, know how to “market” themselves as employers and trigger candidates’ interests in the early stages of their candidate journey. As already mentioned, recruitment marketing strategy is based on implementation of marketing tactics in recruiting. In this Recruitment Marketing 101 guide, my goal is to cover all the elements of the Recruitment Marketing discipline. Employer branding should be a never ending process in which company’s culture, EVP and employer brand are constantly communicated to the potential candidates through different channels or touchpoints. The goal of every employer branding strategy is to build a picture of a desirable employer of choice and attract talent. Here are some employer branding ideas that can bring your employer branding strategy to the next level. Inbound recruiting is a method in which companies, through useful and informative content attract and engage talent. Some forms of content may include company’s career blog, team blogging about interesting projects and many other. Here are the stages of inbound recruiting. In order to keep qualified candidates or leads in your talent pool, you have to have an engagement strategy. Encourage candidates to subscribe to your career newsletter and start building relationships with them. Candidate engagement is considered one of the most important measurements of a successful recruiting strategy. Build outstanding relationships with qualified candidates in your talent pool. Set up email campaigns targeted to your candidates in hard-to-fill talent pools. Communicate your achievement, new job openings, career opportunities, team activities, or any other content that could attract your candidate persona. Finding the right candidates is not easy. Once you manage to do that, it is important to keep them happy. Providing exceptional candidate experience throughout the recruiting, selection and hiring process is a must! Relevant and timely feedback, transparency and openness are just some of the elements of a positive candidate experience. 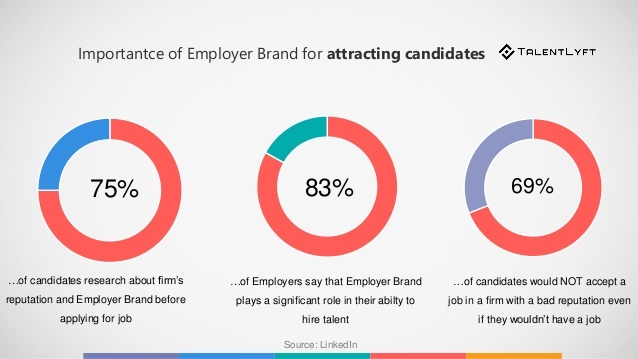 Candidate experience has a big impact on your employer brand. Negative words spread quickly, so try to prevent negative feedback and bad reviews. Same as in marketing, HR has become data-driven. Every step of recruiting can be tracked and measured. Successful recruiters track this data to be able to make better and more informed decisions. Tracking things like website visitors, applicants, source of applicants, newsletter and event conversion rates, hire rates per source, qualified applicant per source, employee referral program performance, time, cost and quality of hire can all give you significant insights into your recruiting strategy. You will then be able to see what is working, and what needs improvement. Not sure what should you measure? 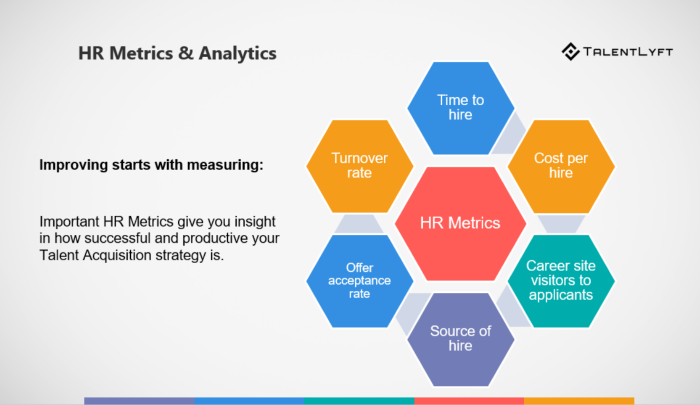 Here is our list of most important hiring metrics. What is a Recruitment Marketing platform? Recruitment Marketing can be simplified by instituting recruitment marketing platforms, such as TalentLyft's Convert and Engage. Software like this allows you to build positive relationships with candidates. Using recruitment marketing platforms recruiters can create different campaigns to target people within specific talent pools and share specific messages with candidates. Recruiters can also save time by scheduling automated emails that allow candidates to see open job requisitions that are relevant to them. Every recruitment marketing platform also has a career site template on which anyone can create an attractive career site that reflects companies’ cultures and values. These are all solutions a recruitment marketing software offers. If you are looking for a Recruitment Marketing platform that can advance your recruitment strategy, schedule a demo with us to see if TalentLyft is a good fit! Recruitment marketing is a discipline that has been introduced as a consequence of the current situation in the labor market. Its main goal is to follow the latest trends in the market, and offer solutions to the companies that best overcome these new challenges. Companies that first adopt these new recruiting best practices will be more likely to attract talent. As attracting talent has become the biggest HR challenge, in the near future I see all recruiters diving into the recruitment marketing discipline.